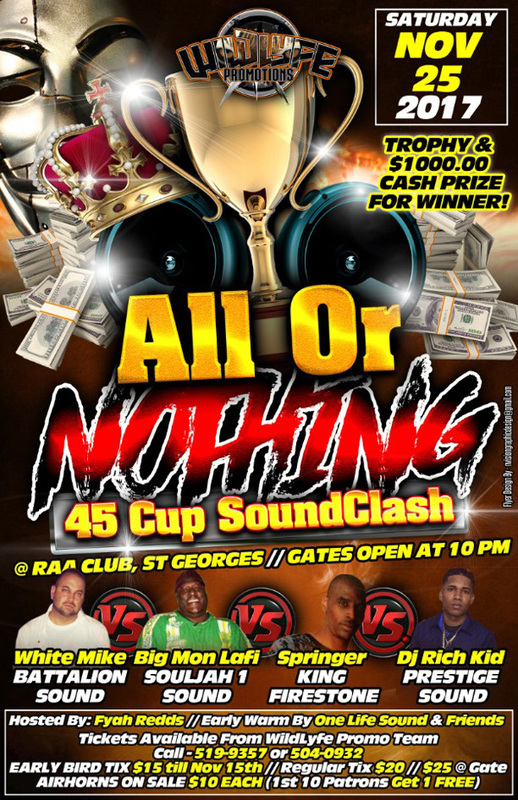 WildLyfe Promotions is getting set to hold “All Or Nothing,” a sound clash event, on Saturday, November 25 at R.A.A Club in St. George’s, with gates to open at 10.00pm. A spokesperson said, “Things seem to be heating up in the reggae/dancehall arena again in Bermuda. “WildLyfe Promotions seems to be one of the few promoters looking to build back an action-packed, crowd responsive, music pounding event known better as sound clash. “WildLyfe Promotions is set to have a full house of sound clash fans ready to see who will Take It All in the upcoming sound clash Saturday November 25 2017 at the R.A.A Club in St. Georges. with this being the 2nd clash of the year for Wildlyfe Promotions with one life sound winning the first clash. “This clash will feature four brand new contestants, including Soulhjah One, King Fire Stone, Battalion, and Prestige Sound, with the stakes being set high with a $1,000 dollar cash prize and a trophy for the winner; this event should be filled with entertainment from all contenders. “This event will be hosted by Fyah Redds of One Life Sound. Admission is $25 at the gate, and tickets are $15 for early birds, which ends November 15th; regular tickets are $20. For tickets, please see flyer for contact information.